In my previous post I mentioned that I want to create flora imprint by physical movement. 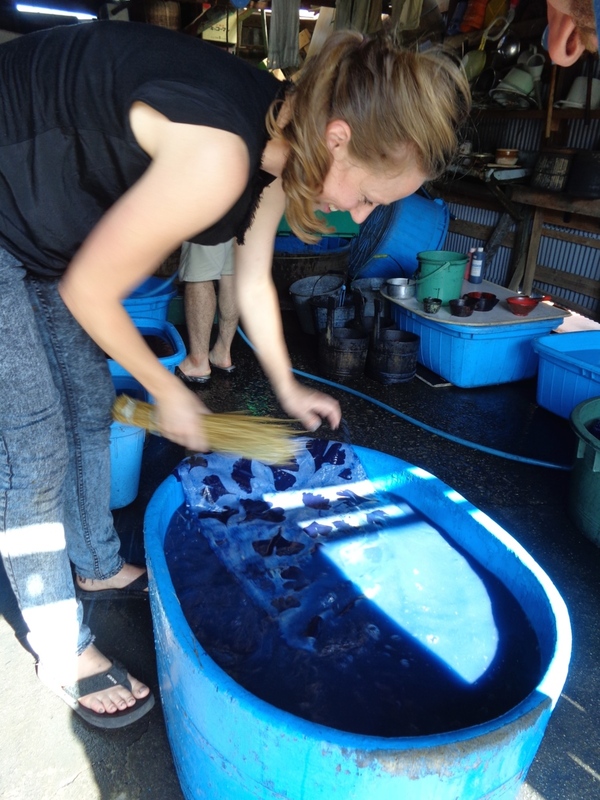 A brief look back at the textile workshop I did last summer in Japan where I had the privilege to spend six full days in the workshop of katazome master Mr. Noguchi. 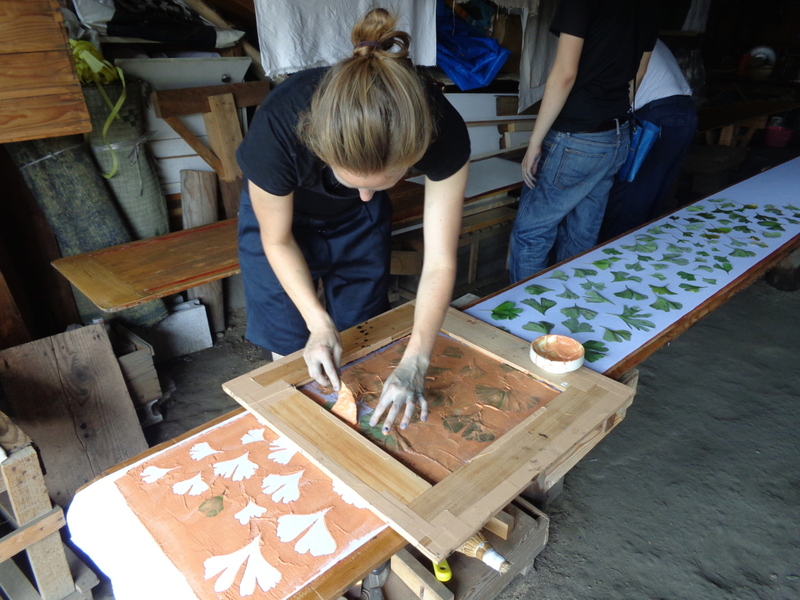 Katazome is a Japanese printing method for textile using a resist paste applied through a stencil. 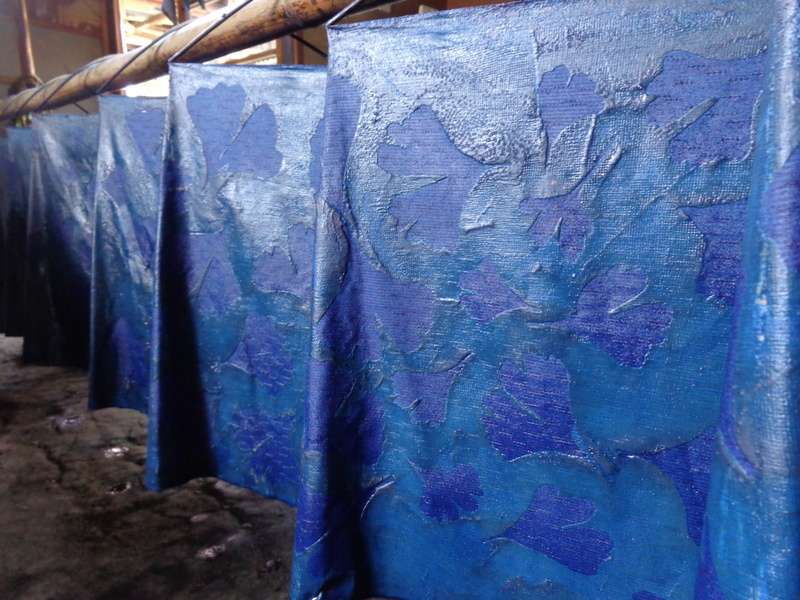 Katazome includes several dyeing techniques that use stencils to create repeated patterns. The technique is different than silkscreen, but comparisons can be made. 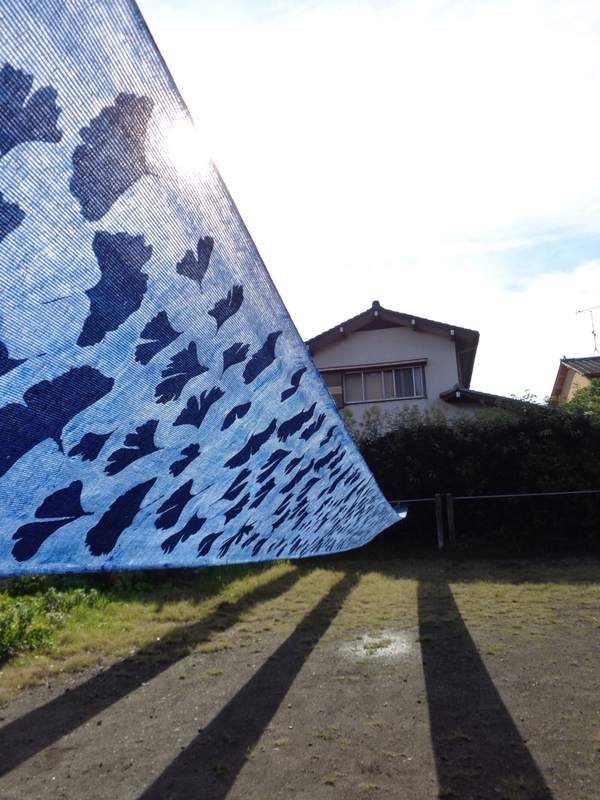 Katagami (stencils) replace the screen and may be washed and reused many times. 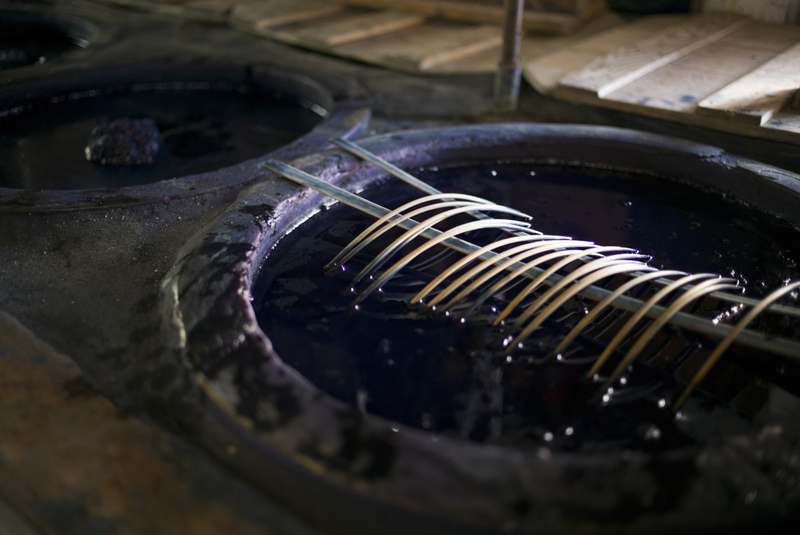 They are hand cut from kozo hand-made paper that has been stiffened with shibugaki (persimmon juice). 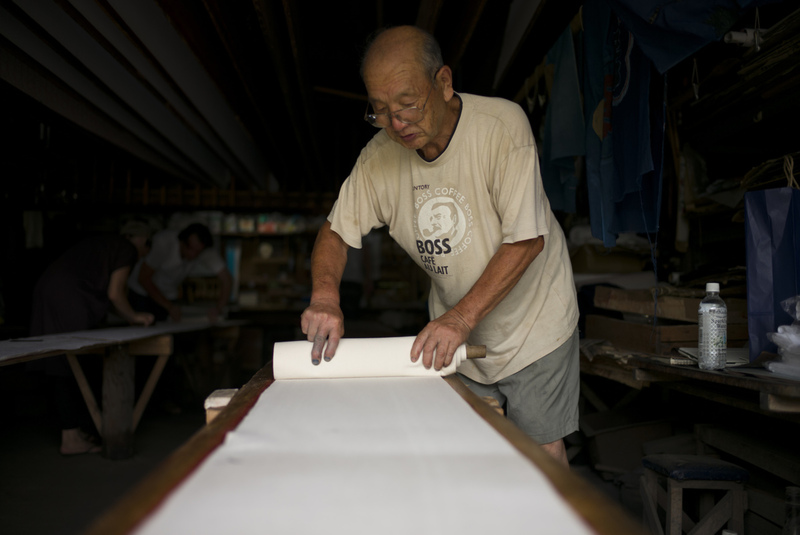 The 78-years old master gave us an insight in the work he is doing since he was 15 years old. 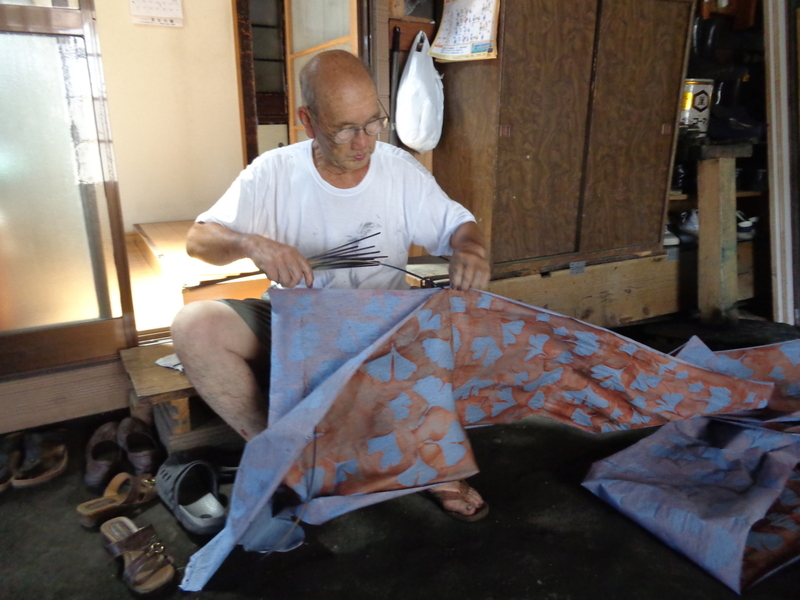 He mainly prints kimono fabrics. Amazing to see how skilled he was, and how his home and workshop merged and how everything was arranged to function. 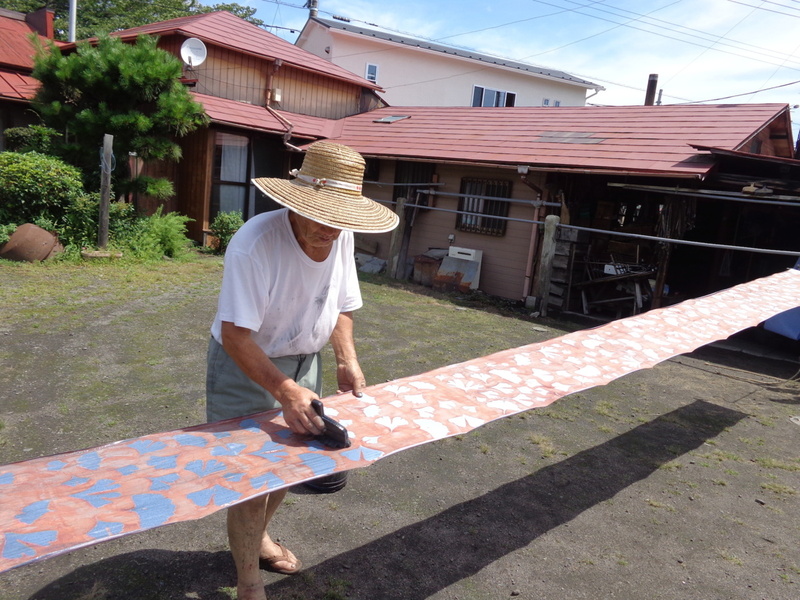 His garden and dyeing workshop are one kimono fabric-length long (13 meters), and the space where he applies the paste on the cloth is half a kimono length as he prints the whole textile in two runs interrupted by the drying process in the sun. The images used on kimono often have complex levels of meaning, and many have specific auspicious significance that derives from religious or popular beliefs. 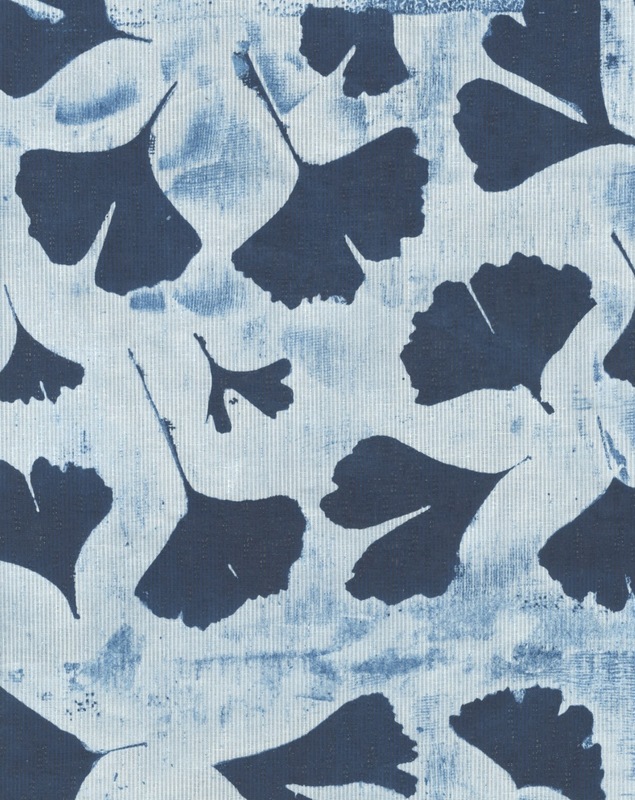 The natural world provides the richest source for kimono motifs. 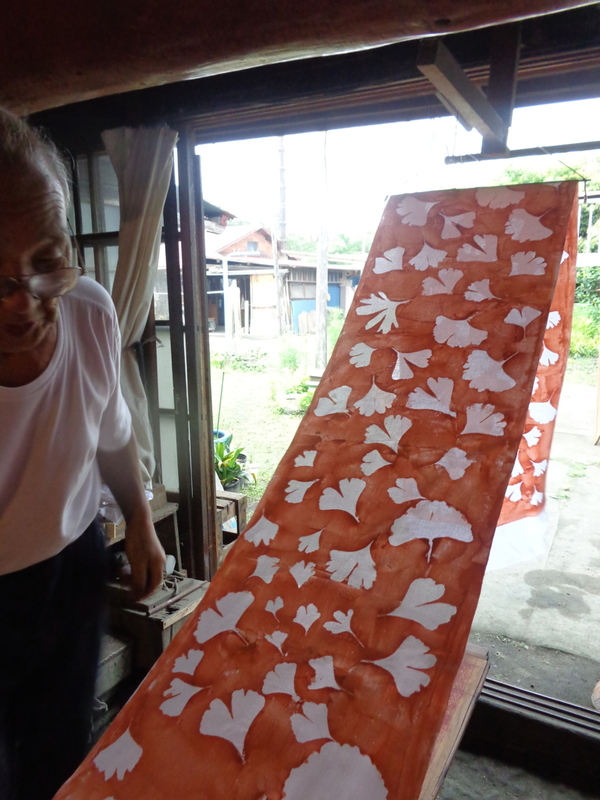 During that week in Japan I decided I would not make a stencil for my final full-length summer kimono fabric (yukuta) and looked for an element to print within the garden of Mr Noguchi. 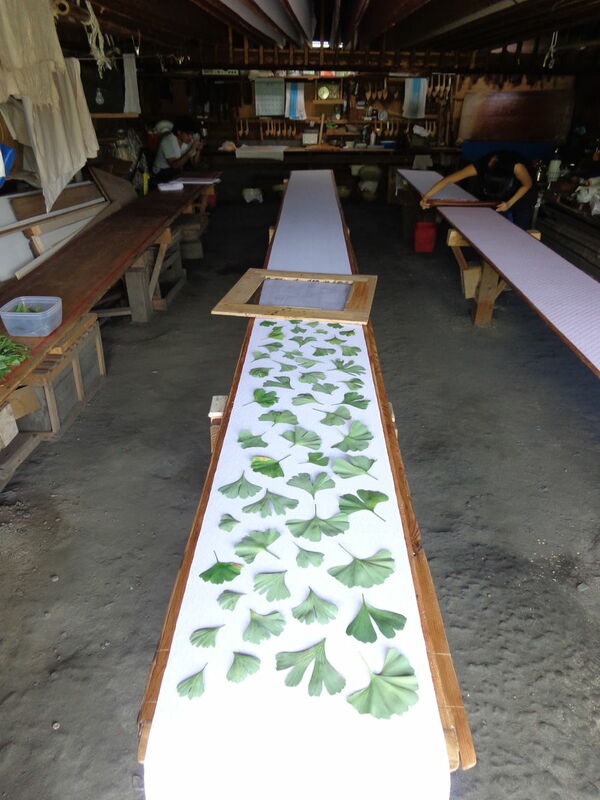 On the day we should have brought our prepared stencil I found a branch of a Ginkgo tree that was cut that morning. 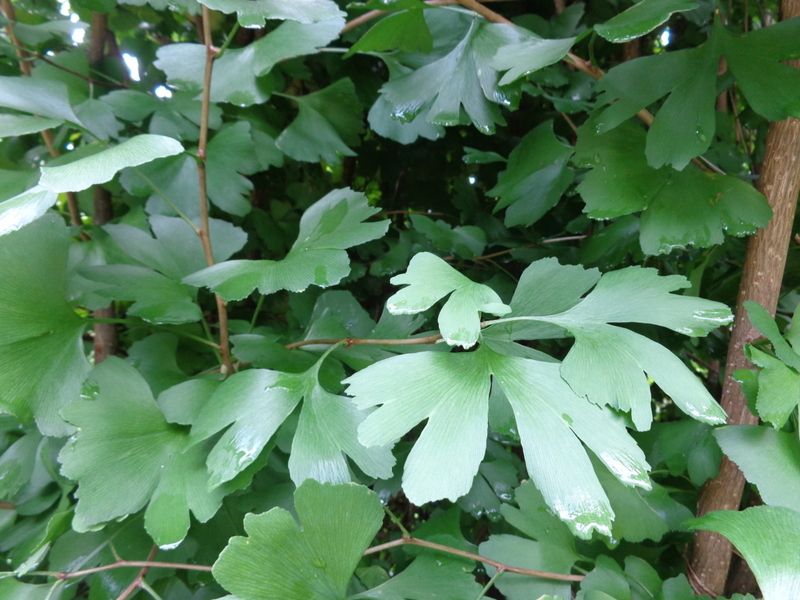 The Ginkgo holds multiple symbolic values and is know as a ‘living fossil’. I collected leaves from the branch and started to play with compositions, discovering that the best pattern was to spread the leaves all over. We used an ‘empty screen’ to put the leaves on place and apply the paste in the interspace. By using the leaves as ‘resistant’ and pasting the openings in between I inverted the process. The fabric in oxidation after the 7th dip. Using real leafs ensured that the quality of the print had no repetitions, and that ‘natural’ mistakes would arise. The master titled the result as 'wabi sabi'. Mission accomplished!